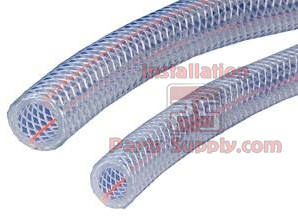 2.0"x2.490"x50' Braided PVC ClearBraid Accuflex K3150 CLEARBRAID Hose features include lightweight, self-extinguishing, non-marking, one-piece lengths, silicone-free, resistant to chemicals and non-conductive. Longitudinally-reinforced to reduce elongation under pressure. Used in a variety of applications; potable water transfer, food and beverage dispensing, juice, beer, soda, CO2 Air lines, marine, packaging machines, pneumatic lines, more! Accepted by the USDA for use in meat and poultry processing plants. Complies with 3-A Sanitary Standards for use in dairy applications. Compound hardness 73 ±3 Shore “A”. Inside Diameter: 3/16" to 2"
Warning: This product can expose you to chemicals, including lead, which are known to the state of California to cause cancer and birth defects or other reproductive harm. For more information visit www.P65Warnings.ca.gov.